Tour guide David Gloier weighs in this week. It's all him from here on out. Well, I've been too busy to actually get any time in with Rocksmith for the past three weeks, but thought I'd at least show up and give out a few bits of advice for those of you just getting underway with your guitar careers. Again, this is all my opinion and your mileage may vary. It's full of invaluable information. If you're going to play, you should know the ins and outs of your instrument. This will help you. If nothing else, learn to properly change your strings. 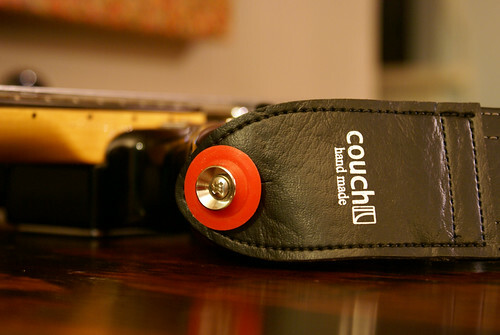 It needs to be done and if you are putting in serious time with your guitar, it likely needs to be done regularly. Next, even though we'd all like to be rock stars and play with our guitars slung low, I'd recommend getting yourself a comfortable stool and playing Rocksmith sitting down. Sitting puts the guitar in the proper position and it will make learning easier and will put a lot less strain on your hands and wrists. Playing with the guitar down around your waist is a different beast altogether and you might want to learn what you're doing before you start imitating your rock idols. I have a basic, wooden bar stool I picked up at Wal-Mart for $20. It does the trick. Anyway, if you're going to put in long stretches of time in with your guitar and Rocksmith, you might as well be comfortable. You get security and a buzz. You can't beat it, and honestly, they work really, really well. I have a friend that gigs with these as his locks after I showed it to him and he's happy with with the security they provide. They should be more than secure enough for sitting around the house playing. Buy a tuner. The tuner in the game isn't very accurate and it pays to be in tune. You can spend a bunch of money on a tuner pedal, but I've been more than happy with my little clip-on Snark. You can get them for around $10 on Amazon or $20 in the stores. They are surprisingly accurate and really easy to use. They just clip on to your headstock and use the vibration to tune. They are perfect for doing a quick tune. I think Bill will vouch for the usefulness of the Snark. In order to protect your guitar when you aren't playing, I'd recommend getting a case, a stand, or a wall hanger. If you have pets or children, get a case or a wall hanger. I have pets and prefer wall hangers. They also allow your guitar to double as wall art. Plus, if your guitar is out and visible, you're more likely to play it. Trust me on this. If you plan on leaving the house with your guitar, get a case as well. I'm not a fan of soft gig bags. They're cheaper than hard cases, but hard cases are cheaper than repairing or replacing a broken guitar. Play away from the game. Get to know your instrument. Just fool around and see where it takes you. If you don't have an amp, look into getting a little practice amp. It's easier to get five or ten minutes in and you avoid the load times. (Well, if it's a tube amp, you do need to let it warm up a bit.) Some inexpensive modeling amps are available that let you play with different sounds without paying a bunch of money. Anyway, I hope everyone is enjoying their new hobby. Hopefully, the payoffs are better than the frustrations.